I am getting ahead of myself here. These are March blocks for the "Around the Block" swap. These blocks are for Bronwyn from Whippet Good. 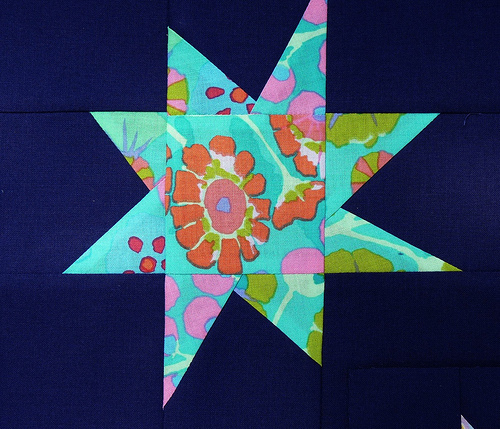 Bronwyn asked for wonky star blocks made with Kaffe Fassett fabric using Kona Cotton in Nightfall as the background. Bronwyn's vision is for a dark night sky filled with sparkly stars; all different sizes, shapes, colors, and placed randomly on the quilt. I pieced four blocks all different sizes, piecing the smallest block (predominantly yellow and blue star) with the leftover scraps of the solid fabric. I used the Wonky Star Tutorial posted by The Silly BooDilly which is simple and straight forward. Although I am not a huge fan of wonky piecing, these wonky stars were easy, and did not feel all that foreign to me. I just walked down the hall toward the computer envisioning a quilt with some sort of dark blue background (I just love how rich colors become on dark gray or blue). It's funny that I should open your post first and see your beautiful wonky stars. I'm sure Bronwyn's quilt will be just gorgeous! Really beautiful! Maybe this will be the direction I head when it is my month in my own block swap. I really like your fabric choices. It makes the stars "POP". 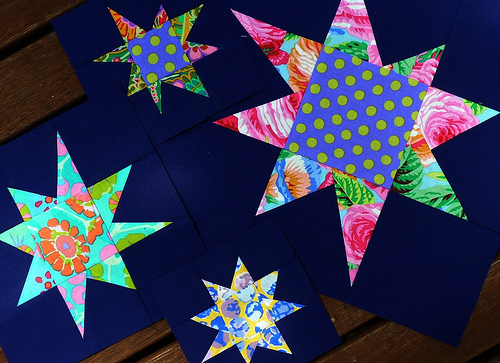 Although not my usual colour choice (and I'm thinking not yours either), these look great and the quilt is really going to look like a starry night!!! As always, lovely. Am really looking forward to seeing this quilt top come together. I just read your tutorial on machine binding a quilt and I think I have been doing it backwards (sewing on the back of the quilt which leaves a sometimes wavy line on the front)with little success. I can't wait to try it the right way next time. Right now I usually hand bind my quilts because my machine binding doesn't look so good. Thanks for the great and clear instructions. I love wonky stars!!! And I think these color combos are just outstanding! Just so pretty. i just used that tutorial myself to make a pillow and i love it....those stars are a favorite around here. Love the stars and the background fabric - it is all doing what it is supposed to - what a lot of fun! I'm still waiting for my fabric to arrive and you are finished! These look great! I'd love to sleep under a night sky like that! Beautiful! Fabulous blocks - I love the wonky stars. I might have to check out that tutorial. Great blocks! That will be one fabulous quilt! Wow! Those are really cool. I love the fabrics you chose for the stars! Huge WOW factor, love the color of blue and the concept. I use this star all the time and have not thought of mimicking sky...LOVE IT!!! Hi,I just found your blog, it's wonderful and inspiring to me. 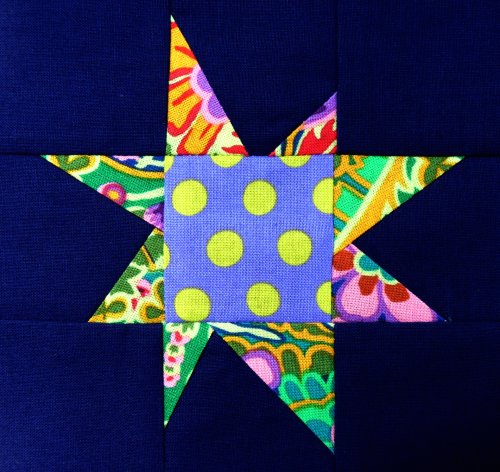 I love the colour choice in your wonky star -- I use so many pastels in my quilts (and decorating) I think I just might try to step outside the pastel box a little. These do seem to glow. I love the stars and I'm going to have to get some of that blue Kona. Gorgeous!